In her original one-act More Than Neighbors, playwright Denise Chapman examines a four-decades old rupture to Omaha’s African-American community still felt today. 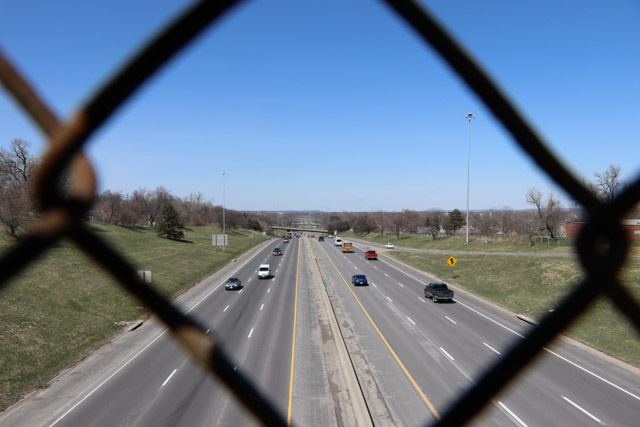 North Freeway construction gouged Omaha’s Near North Side in the 1970s-1980s. Residents got displaced,homes and businesses razed, tight-knit neighborhoods separated. The concrete swath further depopulated and drained the life of a district already reeling from riots and the loss of meatpacking-railroading jobs. The disruptive freeway has remained both a tangible and figurative barrier to community continuity ever since. Chapman’s socially-tinged piece about the changed nature of community makes its world premiere Thursday, May 31 at 7:30 p.m. as part of the Great Plains Theatre Conference’s PlayFest. 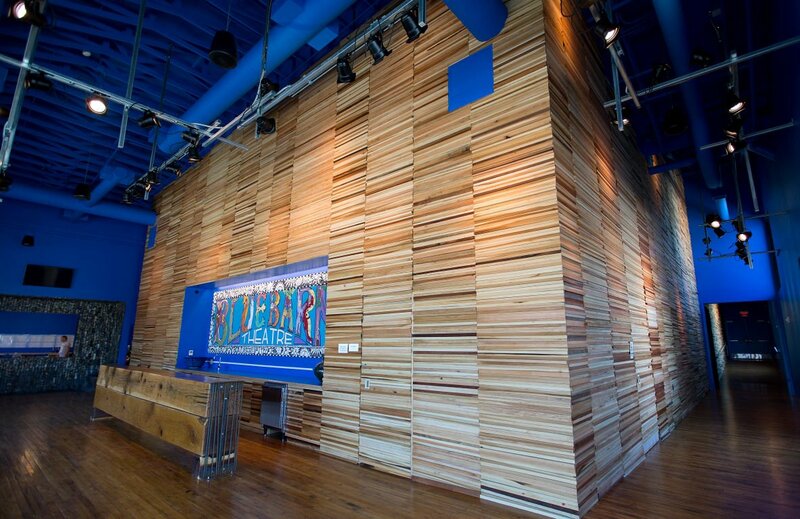 The site of the performance, The Venue at The Highlander, 2112 North 30th Street, carries symbolic weight. The organization behind the purpose-built Highlander Village is 75 North. 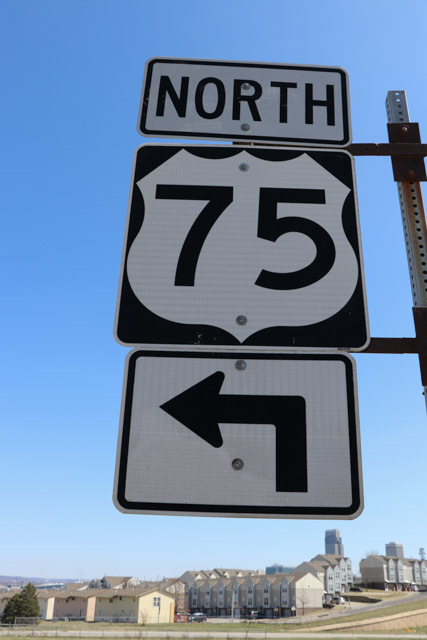 The nonprofit is named for U.S. Highway 75, whose North Freeway portion severed the area. The nonprofit’s mixed-use development overlooks it and is meant to restore the sense of community lost when the freeway went in. The North Freeway and other Urban Renewal projects forced upon American inner cities only further isolated already marginalized communities. “Historically, in city after city, you see the trend of civil unrest, red lining, white flight, ghettoizing of areas and freeway projects cutting right through the heart of these communities,” Chapman said. By designating the target areas “blighted” and promoting public good and economic development, eminent domain was used to clear the way. “You had to get out,” said Chapman, adding, “I talked to some people who weren’t given adequate time to pack all their belongings. They had to leave behind a lot of things.” In at least one case, she was told an excavation crew ripped out an interior staircase of a home still occupied to force removal-compliance. “There was a shift of how we understand community as each of those things happened,” she said. “With the North Freeway, there was a physical separation. What happens when someone literally tears down your house and puts a freeway in the middle of a neighborhood and people who once had a physical connection no longer do? What does that do to the definition of community? It feels like it tears it apart. Dramatizing this where it all went down only adds to the intense feelings around it. Neighbors features an Omaha cast of veterans and newcomers directed by Chicagoan Carla Stillwell. The African-American diaspora drama resonates with Lorraine Hansberry’s A Raisin in the Sun and August Wilson’s Jitney with its themes of family and community assailed by outside forces but resiliently holding on. Three generations of family are at the heart of Chapman’s play, whose characters’ experiences are informed by stories she heard from individuals personally impacted by the freeway’s violent imposition. Faithful Miss Essie keeps family and community together with love and food. Her bitter middle-class daughter Thelma, who left The Hood, now opposes her own daughter Alexandra, who’s eager to assert her blackness, moving there. David, raised by Essie as “claimed family,” and his buddy Teddy are conflicted about toiling on the freeway. David’s aspirational wife, Mae, is expecting. Through it all – love, loss, hope, opportunity, despair, dislocation and reunion – family and home endure. “What makes Denise’s story so warm and beautiful is that it does end with hope,” director Carla Stillwell said. Past and present commingle in the nonlinear narrative. Feelings run deep at PlayFest’s Neighborhood Tapestries series, which alternates productions about North and South Omaha. Neighbors is Chapman’s latest North O work after 2016’s Northside Carnation about the late community matriarch, Omaha Star publisher Mildred Brown. 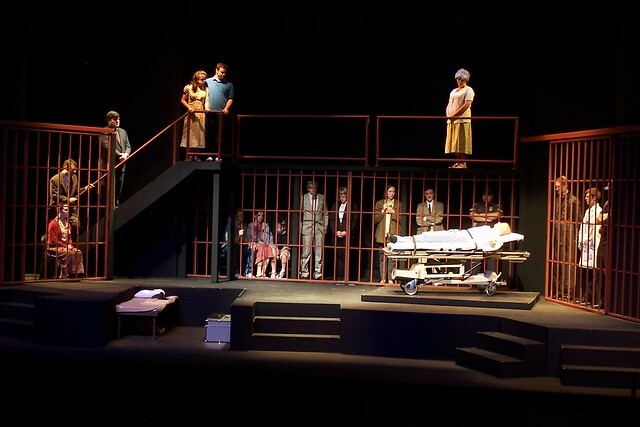 That earlier play is set in the hours before the 1969 riot that undid North 24th Street. Just as Northside found a home close to Brown and her community at the Elk’s Lodge, Neighbors unfolds where bittersweet events are still fresh in people’s minds. 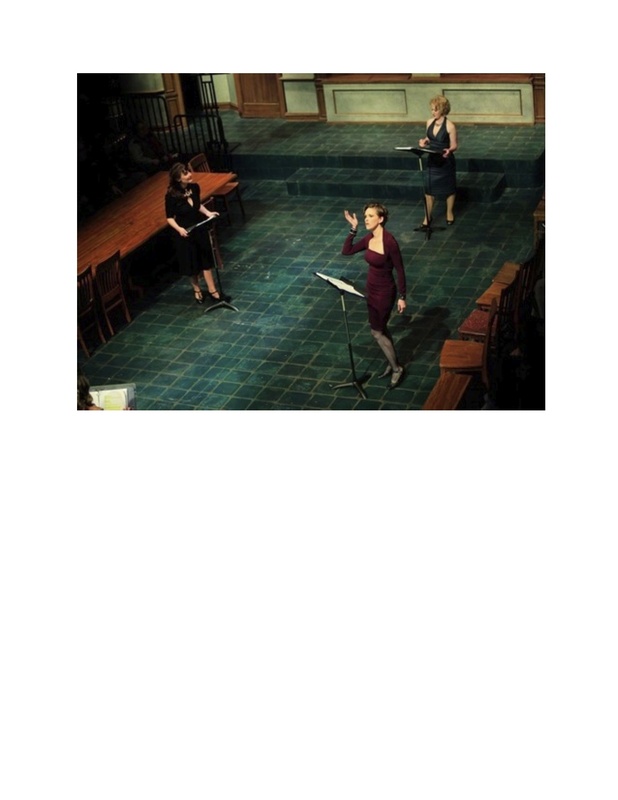 “The placement of the performance at the Highlander becomes so important,” said Chapman, “because it helps to strengthen that message that we as a community are more and greater than the sum of the travesties and the tragedies. ChapMan is sure that Neighbors will evoke memories the same way Northside did. Additional PlayFest shows feature a full-stage production of previous GPTC Playlab favorite In the City in the City in the City by guest playwright Matthew Capodicasa and a “homage collage” to the work of this year’s honored playwright, Sarah Ruhl, a MacArthur Fellowship recipient. Two of Ruhl’s plays have been finalists for the Pulitzer Prize. Capodicasa uses a couple’s visit to the mythical city-state of Mastavia as the prism for exploring what we take from a place. “It’s about how when you’re traveling, you inevitably experience the place through the lens of the people you’re with and how that place is actually this other version of itself – one altered by your presence or curated for your tourist experience,” he said. The Ruhl tribute will be staged at the 40th Street Theatre on Friday, June 1 at 7:30 p.m.
All PlayFest performances are free. For details and other festival info, visit http://www.gptcplays.com. Categories: African-American Culture, Community Redevelopment, Community/Neighborhoods, Denise Chapman, Great Plains Theatre Conference, Highlander Village, More Than Neighbors, Neighborhood Tapestries, Neighborhoods, North Omaha, Omaha, PlayFest, Seventy Five North Revitalization Corp., Writing Tags: Denise Chapman, Great Plains Theatre Conference, Highlander Village, More Than Neighbors, Neighborhoods, Neoghborhood Tapestries, North Omaha, PlayFest, Playwright, Seventy Five North Revitalization Corp.
What would Omaha be without South Omaha? Well, for starters, the city would lose a whole lot of history, culture, character and vitality. Just like the murals springing up all over South Omaha, the area is a mash-up of races, ethnicities, cultures, neighborhoods, traditions, colorful characters and intriguing landmarks that express a diverse tapestry of work, family and social life that not only enriches the city’s livability but that helps make Omaha, well, Omaha. Sometimes though it takes an outsider to appreciate the personality of a place. Los Angeles playwright Michael John Garces has spent time in South Omaha the last couple years familiarizing himself with the area and its people in prepration for creating stage works that celebrate different aspects of South Omaha for the Great Plains Theatre Conference. In 2015 and again in 2017, the conference’s PlayFest is focusing on South Omaha as part of its Neighborhood Tapestries program and each time Garces has gone into the community to extract its essence. His process involves walking the streets, stopping in places to talk to people and formally collecting people’s stories through interviews and exercises he conducts. His resulting new play “South” will be performed at 7:30 p.m. on Wednesday, May 31 during the free PlayFest at Omaha South High School. Some of that school’s students participated in story circles Garces conducted and will perform in the play. This is my story about the appeciation that Garces has gained for South Omaha. The piece appears in the May 2017 issue of The Reader (www.thereader.com). When applied to Omaha, the word refers to a neighborhood and a school where cross-cultural intersections happen every day. South is also the working title and setting of a new play by Los Angeles playwright Michael John Garces. His original work is having its world premiere at South High on Wednesday, May 31 at 7:30 p.m. as part of the May 27-June 3 Great Plains Theatre Conference (GPTC). 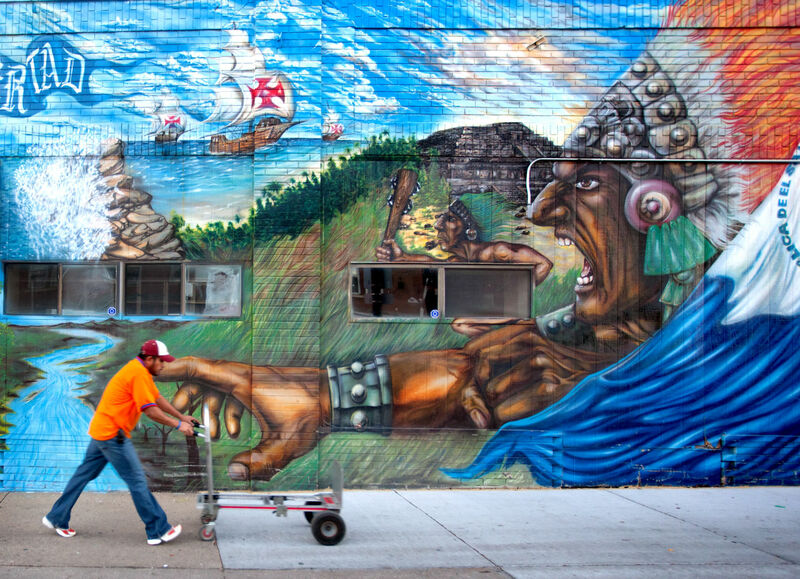 South Omaha’s a landing spot for migrants, immigrants and refugees. South High’s a microcosm of the area and its range of social-racial-ethnic diversity. 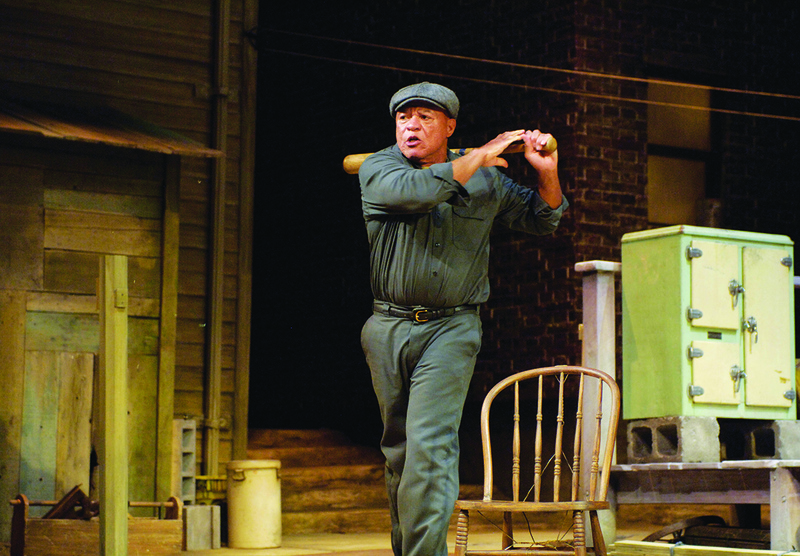 Garces spent time in South O researching his play. He visited there in 2015 for a similar project. His new drama expresses fears, aspirations, issues and traditions of the two primary populations comprising the area today – Anglo-Americans and Mexican-Americans. Other ethnicities are represented in the piece as well. 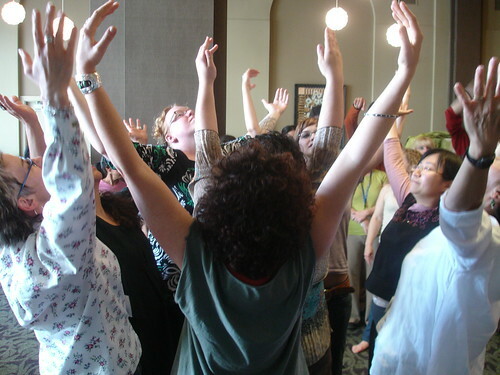 The GPTC production is part of the conference’s community-based PlayFest. The free show featuring South High students will be performed in the school auditorium. South High is at 4519 South 24th Street. The annual conference hosted by Metropolitan Community College takes turns exploring aspects of inner city Omaha through its Neighborhood Tapestries. Last year’s focus was North Omaha. This year, it’s South Omaha. Garces visited last fall garnering the raw material for the play from story circles convened with people who variously live, work and attend school there or otherwise identify as South Omahans. For South, Garces created two fictional families. One, Lithuanian-American. The other, Mexican-American. The lives of Lina, younger sister Gabija and their parents are juxtaposed with the lives of Lupe, younger brother Diego and their parents. The two households contend with things universal across cultures but also singular to their own family and life situation. Once Donald Trump got elected President, Garces returned for an extra story circle, this time with Deferred Action for Childhood Arrivals (DACA) recipients, who expressed concerns about anti-immigrant stands. The threat of DACA’s repeal, wholesale deportations and a border wall were among the concerns shared. By play’s end, Diego’s run afoul of the law and he and Lina have grown apart. Lina and Lupe ponder their respective futures. Lina’s free to go and return as she pleases. Lupe and Diego don’t have that luxury. “Lina is frustrated with some things happening in her community and for her to leave is a different choice then for Lupe to leave because Lina knows she can come back,” said Garces, whose play intentionally explores who America is home to and isn’t today. Questions about identity and home resonate for Garces. “There’s definitely personal connections in the play for me of families being put under stress by political concerns and as a young person having to make those decisions. Some of the interpersonal stuff that happens both within the family and with friends resonates, too. In terms of how South Omahans view themselves, Garces sees a dynamic, healthy tension between permanency and transition. It’s a working-class place with rich history and strong cultural ties, yet always reinventing itself. The one constant is aspiration. “When I talk to people in the taqueria or the school or the Lithuanian Bakery or wherever I go, there’s always this sense of people looking forward to what’s going to be possible for the next generation and what is the neighborhood going to be. It’s been so many things but what it’s going to be is always in question. He said even apart from questions about how federal policies, laws or executive orders might crack down on illegal immigrants, currents of change fill the air. GPTC associate artistic director Scott Working, who’s directing the play, admires what Garces has wrought. Garces was still tweaking the ending in mid-April. 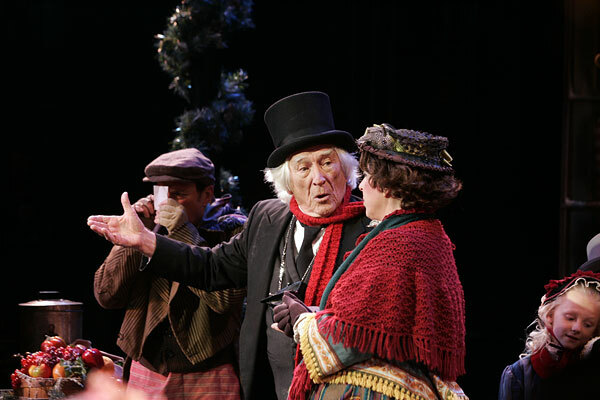 Though he also directs and heads L.A.-based Cornerstone Theater Company, he’s put the production in the hands of Working, co-designers Bill Van Deest and Carol Wisner and costumer Lindsay Pape. Garces has enjoyed the experience of representing the former Magic City in a dramatic structure. He’s also come to feel a kinship for South O. Though he’s learned much over two years, he considers himself “more informed guest” than honorary South Omahan. Upcoming Great Plains Theatre Conference PlayFest productions at nontraditional sites examine North Omaha themes as part of this year’s Neighborhood Tapestries. On May 29 the one-woman play Northside Carnation, both written and performed by Denise Chapman, looks at a pivotal night through the eyes of Omaha Star icon Mildred Brown at the Elks Lidge. On May 31 Leftovers, by Josh Wilder and featuring a deep Omaha cast, explores the dynamics of inner city black family life outside the home of the late activist-journalist Charles B. Washington. Performances are free. As North Omaha Neighborhood Tapestries returns for the Great Plains Theatre Conference’s free PlayFest bill, two community icons take center stage as subject and setting. 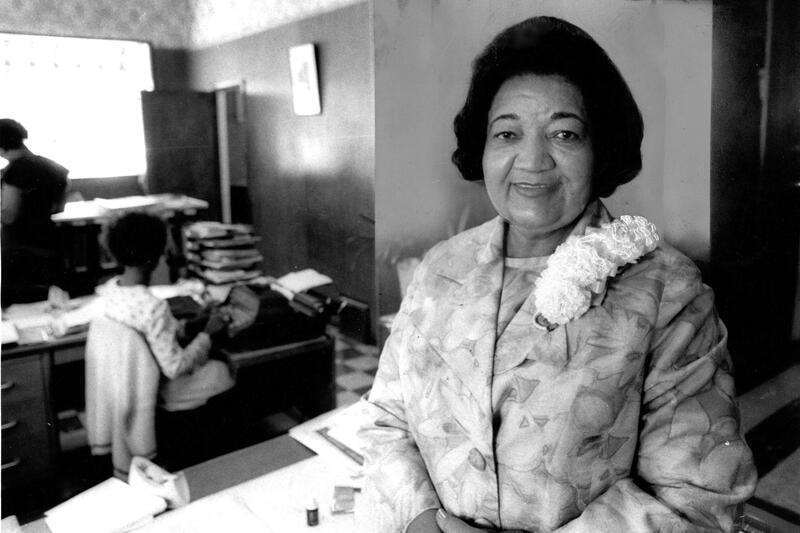 En route to making her Omaha Star newspaper an institution in the African-American community, the late publisher Mildred Brown became one herself. Through the advocacy role she and her paper played, Brown intersected with every current affecting black life here from the 1930s on. That makes her an apt prism through which to view a slice of life in North Omaha in the new one-woman play Northside Carnation. This work of historical fiction written by Omaha theater artist Denise Chapman will premiere Sunday, May 29 at the Elks Lodge, 2420 Lake Street. The private social club just north of the historic Star building was a familiar spot for Brown. It also has resonance for Chapman as two generations of her family have been members. Chapman will portray Brown in the piece. 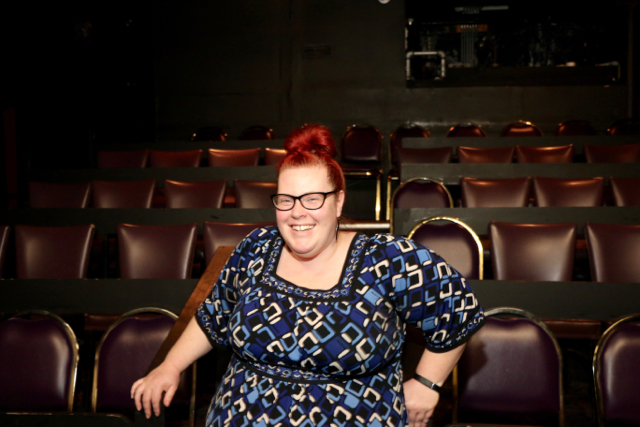 Directing the 7:30 p.m. production will be Nebraska Theatre Caravan general manger Lara Marsh. 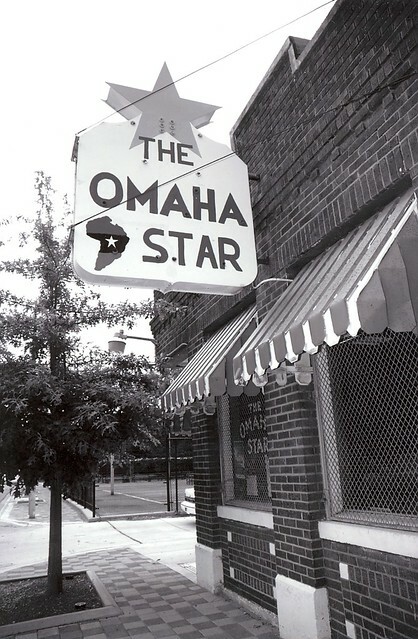 An exhibition of historic North Omaha images will be on display next door at the Carver Bank. A show featuring art by North Omaha youth will also be on view at the nearby Union for Contemporary Art. Two nights later another play, Leftovers, by Josh Wilder of Philadelphia, explores the dynamics of an inner city black family in a outdoor production at the site of the home of the late Omaha activist journalist Charles B. Washington. The Tuesday, May 31 performance outside the vacant, soon-to-be-razed house, 2402 North 25th Street, will star locals D. Kevin Williams, Echelle Childers and others. 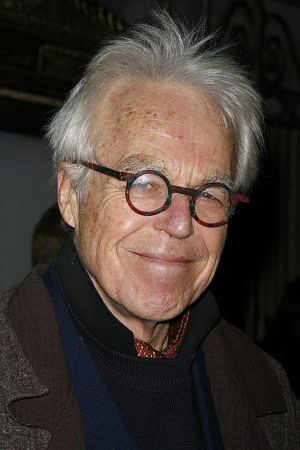 Levy Lee Simon of Los Angeles will direct. Just as Washington was a surrogate father and mentor to many in North O, Brown was that community’s symbolic matriarch. Chapman says she grew up with “an awareness” of Brown’s larger-than-life imprint and of the paper’s vital voice in the community but it was only until she researched the play she realized their full impact. “She was definitely a very important figure. She had a very strong presence in North Omaha and on 24th Street. I was not aware of how strong that presence was and how deep that influence ran. She was really savvy and reserved all of her resources to hold space and to make space for people in her community – fighting for justice. insisting on basic human rights, providing jobs, putting people through school. Brown was one of only a few black female publishers in the nation. Even after her 1989 death, the Star remained a black woman enterprise under her niece, Marguerita Washington, who succeeded her as publisher. Washington ran it until falling ill last year. She died in February. The paper continues printing with a mostly black female editorial and advertising staff. Chapman’s play is set at a pivot point in North O history. The 1969 fatal police shooting of Vivian Strong sparked rioting that destroyed much of North’s 24th “Street of Dreams.” As civil unrest breaks out, Brown is torn over what to put on the front page of the next edition. “She’s trying her best to find positive things to say even in times of toil,” Chapman says. “She speaks out reminders of what’s good to help reground and recenter when everything feels like it’s upside down. It’s this moment in time and it’s really about what happens when a community implodes but never fully heals. During the course of the evening, Chapman has Brown recall her support of the 1950s civil rights group the De Porres Club and a battle it waged for equal job opportunities. Chapman, as Brown, remembers touchstone figures and places from North O’s past, including Whitney Young, Preston Love Sr., Charles B. Washington, the Dreamland Ballroom and the once teeming North 24th Street corridor. To facilitate this flood of memories Chapman hit upon the device of a fictional young woman with Brown that pivotal night. Chapman has been studying mannerisms of Brown. But she’s not as concerned with duplicating the way Brown spoke or walked, for instance, as she is capturing the essence of her impassioned nature. Chapman acknowledges taking on a character who represented so much to so many intimidated her until she found her way into Brown. For the complete theater conference schedule, visit https://webapps.mccneb.edu/gptc/. Omaha’s various geographic segments feature distinct charecteristics all their own. South Omaha has a stockyards-packing plant heritage that lives on to this day and it continues its legacy as home to new arrivals, whether immigrants or refugees. The free May 27 Great Plains Theatre Conference PlayFest show South Omaha Stories at the Livestock Exchange Building is a collaboration between playwrights and residents that shares stories reflective of that district and the people who comprise it. What follows are two articles I did about the event. The first and most recent article is for The Reader (www.thereader.com) and it looks at South O through the prism of two young people interviewed by playwrights for the project. The second article looks at South O through the lens of three older people interviewed by playwrights for the same project. Together, my articles and participants’ stores provide a fair approximation of what makes South O, well, South O. Or in the vernacular (think South Side Chicago), Sou’d O. Perhaps more than any geographic quadrant of the city, South Omaha owns the richest legacy as a livestock-meatpacking industry hub and historic home to new arrivals fixated on the American Dream. Everyone with South O ties has a story. When some playwrights sat down to interview four such folks, tales flowed. Using the subjects’ own words and drawing from research, the playwrights, together with New York director Josh Hecht, have crafted a night of theater for this year’s Great Plains Theatre Conference’s Neighborhood Tapestries. Omaha’s M. Michele Phillips directs this collaborative patchwork of South Omaha Stories. The 7:30 p.m. show May 27 at the Livestock Exchange Building ballroom is part of GPTC’s free PlayFest slate celebrating different facets of Neb. history and culture. In the case of South O, each generation has distinct experiences but recurring themes of diversity and aspiration appear across eras. Lucy Aguilar and Batula Hilowle are part of recent migration waves to bring immigrants and refugees here. Aguilar came as a child from Mexico with her undocumented mother and siblings in pursuit of a better life. Hilowle and her siblings were born and raised in a Kenya refugee camp. They relocated here with their Somali mother via humanitarian sponsors. In America, Batula and her family enjoy new found safety and stability. Aguilar, 20, is a South High graduate attending the University of Nebraska at Omaha. 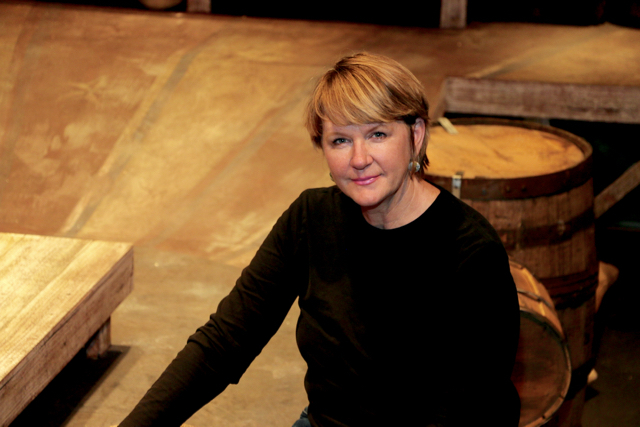 GPTC associate artistic director and veteran Omaha playwright Scott Working interviewed her. Hilowle, 19, is a senior at South weighing her college options. Harlem playwright Kia Corthron interviewed her. A Deferred Action for Childhood Arrivals (DACA) work permit recipient, Aguilar is tired of living with a conditional status hanging over head. She feels she and fellow Dreamers should be treated as full citizens. State law has made it illegal for Dreamers to obtain drivers licenses. “I’m here just like everybody else trying to make something out of my life, trying to accomplish goals, in my case trying to open a business,” and be successful in that,” Aguilar says. She’s active in Young Nebraskans for Action that advocates restrictions be lifted for Dreamers. She follows her heart in social justice matters. She embraces South O as a landing spot for many peoples. Hilowle appreciates the diversity, too. Both young women find it a friendly environment. Hilowle says playwright Kia Corthon was particularly curious about the transition from living in a refuge camp to living in America. Hilowle has found most people receptive to her story of struggle in Africa and somewhat surprised by her gratitude for the experience. She says the same fierce determination that drove her mother to save the family from war in Somalia is in her. Aguilar, a business major seeking to open a South O juice shop, likes that her and Hilowle’s stories will be featured in the same program. Similar to Lucy, Batula likes helping people. She’s planning a pre-med track in college. The young women think it’s important their stories will be presented alongside those of much older residents with a longer perspective. Virgil Armendariz, 68, who wrote his own story, can attest South O has long been a melting pot. He recalls as a youth the international flavors and aromas coming from homes of different ethnicities he delivered papers to and his learning to say “collect” in several languages. He remembers the stockyards and Big Four packing plants and all the ancillary businesses that dominated a square mile right in the heart of the community. The stink of animal refuse permeating the Magic City was called the Smell of Money. Rough trade bars and whorehouses served a sea of men. The sheer volume of livestock meant cows and pigs occasionally broke loose to cause havoc. He recalls unionized packers striking for better wages and safer conditions. Joseph Ramirez, 89, worked at Armour and Co. 15 years. He became a local union leader there and that work led him into a human services career. 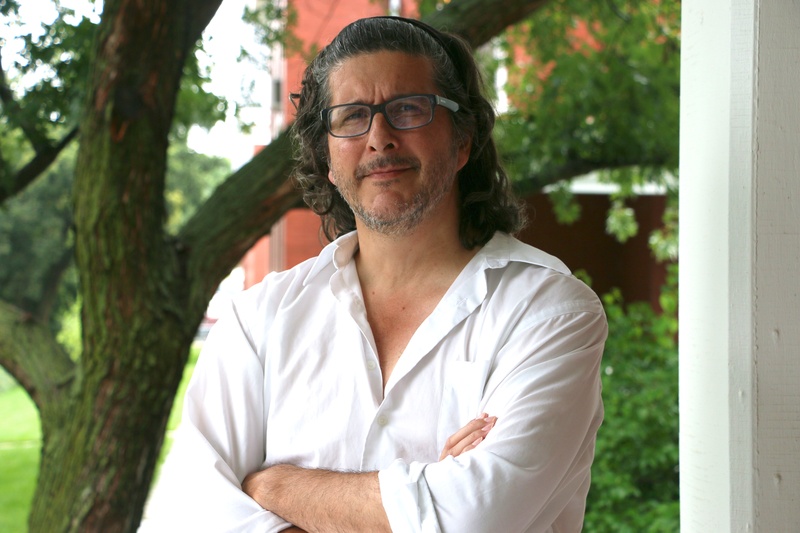 New York playwright Michael Garces interviewed Ramirez. Ramirez and Armendariz both faced discrimination. They dealt with bias by either confronting it or shrugging it off. Both men found pathways to better themselves – Ramirez as a company man and Armendariz as an entrepreneur. While their parents came from Mexico, South Omaha Stories participant, Dorothy Patach, 91, traces her ancestry to the former Czechoslovakia region. Like her contemporaries of a certain age, she recalls South O as a once booming place, then declining with the closure of the Big Four plants, before its redevelopment and immigrant-led business revival the last few decades. Patach says people of varied backgrounds generally found ways to co-exist though she acknowledges illegal aliens were not always welcome. New York playwright Ruth Margraff interviewed her. She and the men agree what united people was a shared desire to get ahead. How families and individuals went about it differed, but hard work was the common denominator. Scott Working says the details in the South O stories are where universal truths lay. The Livestock Exchange Building is at 4920 South 30th Street. Next year’s Neighborhood Tapestries event returns to North Omaha. For PlayFest and conference details, visit http://www.mccneb.edu/gptc. Historically, South Omaha is a melting pot where newcomers settle to claim a stake of the American Dream. This hurly burly area’s blue-collar labor force was once largely Eastern European. The rich commerce of packing plants and stockyards filled brothels, bars and boardinghouses. The local economy flourished until the plants closed and the yards dwindled. Old-line residents and businesses moved out or died off. New arrivals from Mexico, Central America, South America and Africa have spurred a new boon. 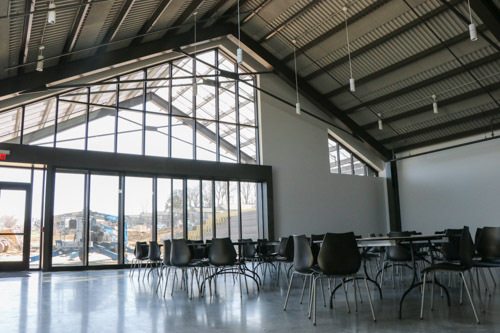 Repurposed industrial sites serve today’s community needs. As a microcosm of the urban American experience it’s a ready-made tableaux for dramatists to explore. That’s what a stage director and playwrights will do in a Metropolitan Community College-Great Plains Theatre Conference project. The artists will interview residents to cultivate anecdotes. That material will inform short plays the artists develop for performance at the GPTC PlayFest’s community-based South Omaha Neighborhood Tapestries event in May. Director Josh Hecht and two playwrights, Kia Corthron and Ruth Margraff, will discuss their process and preview what audiences can expect at a free Writing Workshop on Saturday, January 24 at 3 p.m. in MCC’s South Campus (24th and Q) Connector Building. Participants Virgil Armendariz and Joseph Ramirez hail from Mexican immigrant clans that settled here when Hispanics were so few Armendariz says practically everybody knew each other. Their presence grew thanks to a few large families. Similarly, the Emma Early Bryant family grew a small but strong African-American enclave. 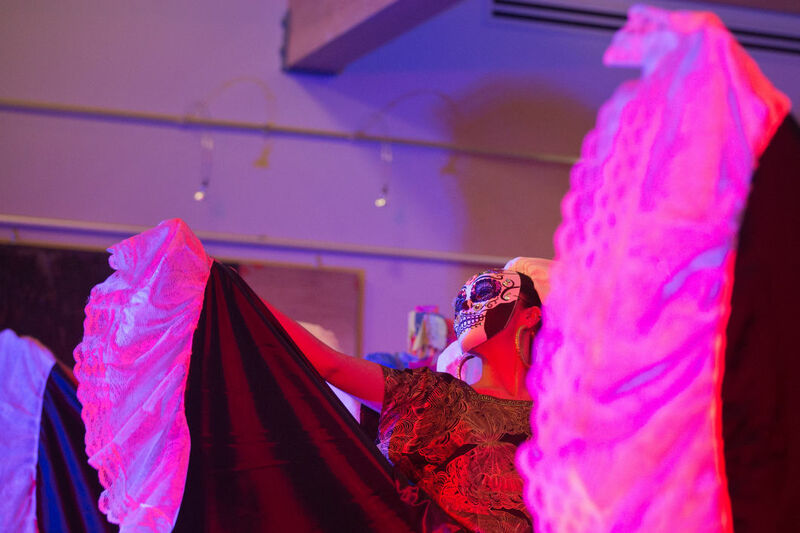 Dancers from Xiotal Omaha’s Día de Muertos perform at Metro Community College’s Fort Omaha Campus on Nov. 1. Hector Marino talks with the performers of Xiotal Omaha before their Día de Muertos performance at Metro Community College’s Fort Omaha Campus on Saturday, Nov. 1. He says recent immigrants and refugees practice more cultural traditions than he knew growing up. 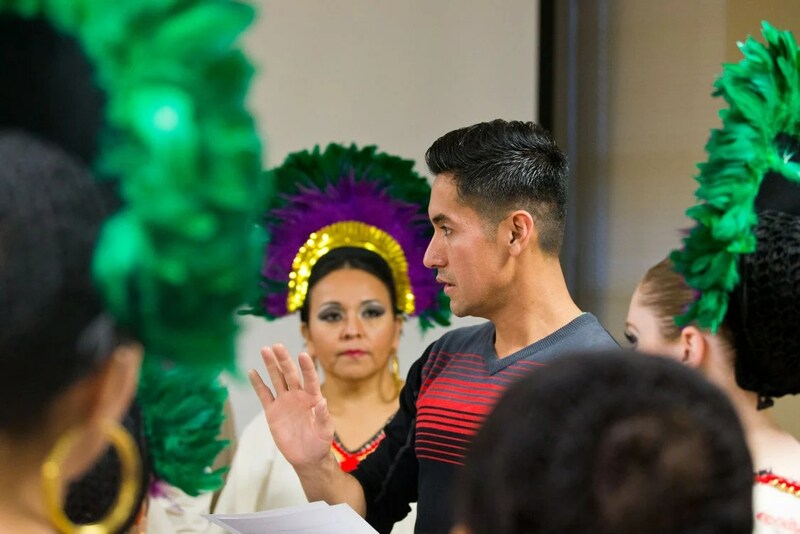 He and his wife, long active in the South Omaha Business Association, enjoy connecting to their own heritage through the Xiotal Ballet Folklorico troupe they support. Ramirez, whose parents fled the Cristero Revolt in Mexico, says he and his wife faced discrimination as a young working-class couple integrating an all-white neighborhood. But overall they found much opportunity. He became a bilingual notary public and union official while working at Armour and Co. He later served roles with the Urban League of Nebraska and the City of Omaha and directed the Chicano Awareness Center (now Latino Center of the Midlands). His activist-advocacy work included getting more construction contracts for minorities and summer jobs for youths. The devout Catholic lobbied the Omaha Archdiocese to offer its first Spanish-speaking Mass. Dorothy Patach came up in a white-collar middle-class Bohemian family, graduated South High, then college, and went on to a long career as a nursing care professional and educator. Later, she became Spring Lake Neighborhood Association president and activist, helping raise funds for Omaha’s first graffiti abatement wagon and filling in ravines used as dumping grounds. She says the South O neighborhood she lived in for seven decades was a mix of ethnicities and religions that found ways to coexist. She, too, is proud of her South O legacy and eager to share its rich history with artists and audiences. Josh Hecht finds it fascinating South O’s “weathered the rise and fall of various industries” and absorbed “waves of different demographic populations.” “In both of these ways” he says, “the neighborhood seems archetypally American.” Hecht and Co. are working with local historian Gary Kastrick to mine more tidbits. Hecht conceived the project when local residents put on “a kind of variety show ” for he and other visiting artists at South High in 2013. Working says, “This project will be a deeper exploration and more intimate exchange between members of the community and dramatic artists” than previous Tapestries. The production is aptly slated for the Stockyards Exchange Building, the last existing remnant of South O’s vast packing-livestock empire.